Easily disassembles into five super lightweight pieces for convenient transport in your car trunk or storage in a closet. A wraparound delta-style tiller helps in turning the scooter if you suffer pain and/or stiffness in your arms and shoulders. With an overall length of 43” and a turning radius of 52” the Pride Mobility Go-Go Sport 4-Wheel is definitely not intended for use inside the home. With a minimal ground clearance of just 1.5” and without springs or any form of shock absorption the ride can get very bumpy. Sturdy, reliable and easy to put together and take apart and as I’ve said Pride Mobility is a good company that stands behind its products so this scooter is worth checking out! 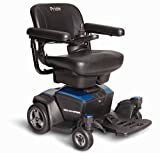 I’ve had Pride Mobility products for twelve years and I must say that, except for a few minor irritants, their products have always lived up to high expectations. Because I have balance problems, I feel much more secure on a wheelchair than I do on a scooter. 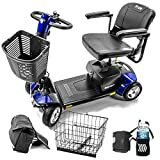 But I have a very good friend who has one of these Pride Mobility Go-Go Sport 4-Wheel scooters and when we go out together I am always impressed by how solid and reliable it is and how easy it is to assemble and disassemble. 1. The suggested weight capacity is 325 lbs., the maximum speed is 4+ mph with a travel range of 12+ miles on a charge. 2. The unit weighs 127 lbs. (with the batteries installed), the front section at 44 lbs. being the heaviest piece. The scooter easily disassembles into five super lightweight pieces – seat, battery box, front section with the fold-down tiller, rear section with the drivetrain and the front basket – for convenient transport in your car trunk or storage in a closet. 3. A wraparound delta-style tiller helps in turning the scooter if you suffer pain and/or stiffness in your arms and shoulders. 4. Two 12V 18Ah “deep-cycle” batteries and pack weigh 30 lbs. (NOTE: Pride Mobility say that their products ship with either SLA (Sealed Lead Acid) or Gel-Cell batteries, whichever they have on hand – but both types are “deep-cycle.”) These “deep-cycle” batteries are FAA (Federal Aviation Administration) approved, allowing for safe transportation on aircraft and are safe on buses and trains, as there is no danger of spillage or leakage. 5. The batteries can be charged either off-board or on-board via the charger port which is high up on the front tiller, a feature worth considering for someone with limited mobility. In addition the dual-voltage charger can be useful when traveling outside the US. 6. The brakes are “electromechanical”, so the scooter will stop very quickly, yet smoothly, once the throttle is released – preventing a sudden stop and the occupant being thrown forward, maybe out of the scooter. 7. And there is also an innovative “regenerative” braking system – when braking the scooter’s electric motor functions as a generator, producing electricity and feeding it back into the battery, helping to extend the travel range of the unit. 8. The 17”x17” seat swivels and locks into several positions when you release the lever. 9. Four 9” wheels have solid, non-scuffing black rubber tires and there are two anti-tip rear wheels. 10. A front tiller-mounted basket (with handle) is included and there is also a smaller deck mounted basket for storage of your keys, phone etc. A front LED light provides added security. Available accessories include a safety flag, a cane holder and a walker holder. 11. And it comes with two sets of easily interchangeable red and blue colored shroud panels – so you can even color-coordinate! There is a lifetime (limited) warranty on the frame and seat frame, a two-year (limited) warranty on the electronics and drivetrain and a six-month warranty on the batteries. With a minimal ground clearance of just 1.5” and without springs or any form of shock absorption the ride can get very bumpy. So, although it may be drivable on grass or hard-packed gravel it is always recommended to try to stay on smooth, hard surfaces, free of potholes, large rocks and steep inclines. So if you have a convenient place to store the Pride Mobility Go-Go Sport 4-Wheel Heavy Duty S74 or have a large accessible living space then this scooter has a lot of pluses – it’s sturdy, reliable and easy to put together and take apart. As I’ve said Pride Mobility is a good company that stands behind its products so this scooter is worth checking out!